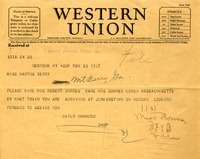 Emily Vanderbilt Hammond's secretary encloses Hammond's check for a scholarship in response to a Southern Highlander article. In this letter Martha Berry discusses a great need for roofing tiles at the schools. She ends the letter on a more personal note with mention of Adele's wedding. Although he believes that Martha Berry made a mistake in the way she handled Adolph Ochs, he is interested in helping the school. 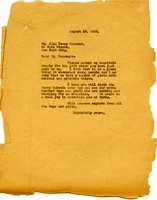 Emily Vanderbilt Hammond adds a note about planned correspondence and tags the letter "read and destroy." 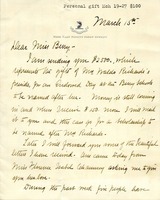 Receipt for checks forwarded by Hammond and credited to the second endowed day for Mrs. Waldo Richards. Hammond asks Berry to wire Mrs. Robert Durges and about her travel arrangements. 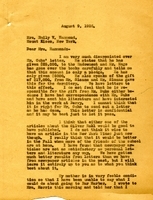 Hammond writes about several gifts that are to be used for scholarships and an endowed day in memory of Mrs. Waldo Richards, and provides detailed information about plans for the pilgrimage. 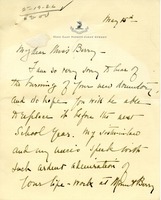 Harriet Hammond writes to Martha Berry because she has heard much about the schools from her sister-in-law. She is very sad about the destroyed dormitory and has enclosed a donation for the school. 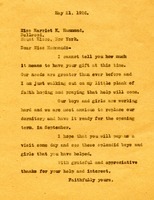 Martha Berry thanks Harriet Hammond for her donation to the schools. Berry tells her that they are working very hard to get the buildings ready for the new term, and hopes Harriet will visit sometime so she may see the work of the schools. 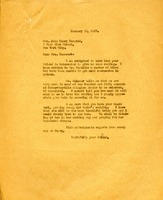 Martha Berry writes to Emily Hammond about some fundraising business, expressing dismay about Mr. Ochs' work and pledges. She also asks to hold off publishing an article in the New York Times about the schools. 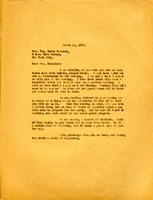 Emily Hammond writes to Martha Berry about a number of things including Mr. Ochs' contributions to the schools and Adele's upcoming engagement. The letter details a visit to Ms. Hammond by Mr. Ochs, who was upset by a letter from Mr. Hoge which questions Ochs' contribution to the school and therein his good faith. 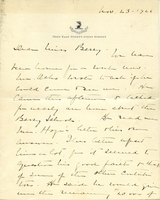 Hammond recommends that Berry write to him personally about the situation. 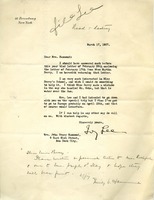 Hammond also recommends Berry write personally to Rockefeller and others. 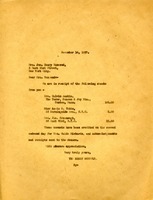 Adele Sloane Hammond, Adolph Ochs, Alice Frances Hammond, Arthur Duckworth, Brace Up Thoughts, Emily Vanderbilt Hammond, engagement, John Kensett Olyphant Jr.
Martha Hutcheson writes to Mrs. Hammond because she cannot attend the meeting with Martha Berry. She knows how important Berry's work is, so she is encloses a $10 check to help with the work they do at the schools. 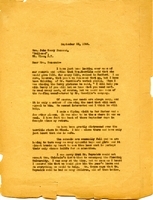 Martha Berry writes to Mrs. Hammond about a number of things, including fundraising, a recent trip to Bar Harbor, and the schools' enrollments and thanked her again for her recent hospitality. Martha Berry thanks Mr. Hammond for sending a gift that will benefit some of the girls at the schools who have musical and artistic talents. She also hopes he will visit the schools at some point.